Many travelers to San Diego are repeat visitors. While San Diego has a number of very popular tourist attractions like the Zoo, Sea World, Balboa Park, the beach, etc., return travelers may want to experience something different than what they’ve done before. We’ve scouted out three unique San Diego outdoor activities perfect for both first time and repeat visitors, as they take advantage of our sunny weather, visit some of the popular places in San Diego, and provide a unique way to experience them. We have seen GoCar Tours’ little three-wheeled yellow cars driving around downtown San Diego for eight years. We’ve always wanted to try them out, but never got around to it until now. Boy were we missing out! San Diego GoCar Tours’ cars provide a GPS guided tour of four popular areas of San Diego: (1) Downtown/Harbor/Seaport Village/Gaslamp, (2) Balboa Park/Hillcrest, (3) Old Town/Presidio Park, and (4) Point Loma. GoCars can be rented from one hour to all day. 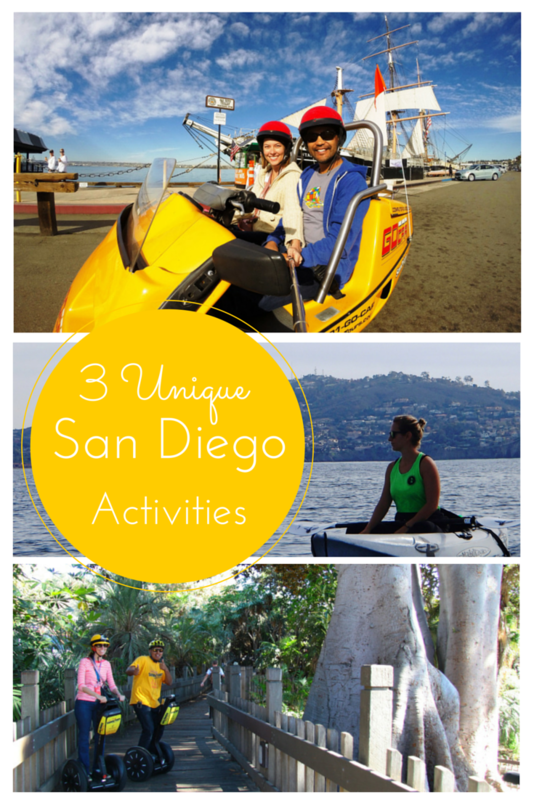 We took our GoCar for three hours and explored downtown, Balboa Park, and Old Town. Each area covered by a tour includes 50 minutes of driving time and allows for 10 minutes to stop and explore along the way. Driving a GoCar is similar to driving a motorcycle in that everything is controlled by hand. You twist the grip to give it gas and use the hand brakes to stop. It’s easier than a motorcycle, however, as there is no shifting. The top speed is 30 miles per hour, so don’t plan on drag racing along the streets of San Diego. The radio plays the GPS commentary. Note that while the GPS knows where you are on the designated route, if you go off-route it can’t guide you back, so you will need to pay attention to the provided map if you take a detour. All GoCar tours start at the GoCar office conveniently located in downtown San Diego’s Little Italy neighborhood. After going around the block to make sure everything is working, the tour begins first by heading down to Harbor Drive along the San Diego Bay. You’ll drive by the tall ships, the U.S.S. Midway Aircraft Carrier Museum, Unconditional Surrender (also known as the San Diego kissing statue), and Seaport Village. The route then turns into downtown, passing by Horton Plaza and Petco Park before passing through the Historic Gaslamp Quarter. I’ve worked downtown for 20 years, but driving through the Historic Gaslamp Quarter in the tiny open GoCar made me see the architecture and color of the buildings in a completely different way. In addition to providing directions, the GPS also gives fun facts about San Diego. For instance, I didn’t realize Wyatt Earp had come to San Diego after the shootout at the OK Corral, purchased some buildings in what was then called the Stingaree District, and leased some saloons and gambling halls. The next area covered during our tour was Balboa Park. We drove through Kate Sessions Park and learned about how this parkland was created in San Diego. We drove across the Cabrillo Bridge and passed many of Balboa Park’s museums including the San Diego Museum of Man with its famous tower and the San Diego Air & Space Museum. After passing by the San Diego Zoo we drove through the Hillcrest neighborhood, past the oldest nursery in San Diego, opened by Kate Sessions in 1910, and down a back neighborhood road into Presidio Park and through Old Town. While I was nervous at first about riding around in such a tiny vehicle, that went away in a few minutes and then it was just fun. We’re both pretty sure we had goofy smiles on our faces the entire time because our drive was such a fun and different experience. Everybody we passed along the way looked, smiled, and waved too. Going to the beach is a popular San Diego activity, but what about seeing the beach from a vantage point out in the Pacific Ocean? To do so, we joined one of Everyday California’s La Jolla kayak tours. Since we took a tour in winter, we joined the whale watching kayak tour which is only available November to March. However, Everyday California offers Pacific Ocean tours year-round, including sea cave kayak tours, sunset kayak tours, combined kayak and snorkel tours, snorkeling tours, and paddle-boarding tours. Our tour took us approximately two miles out into the waters of the Pacific Ocean. We learned there is a large ocean canyon off of the shores of La Jolla, which is why whales can often be seen there so close to land. The canyon provides areas deep enough for the whales to dive and feed, but also provides the shallows nearby. Even though we didn’t see any whales or dolphins, we did get to see other sea life. During a kayak trip through the La Jolla waters, you will most likely encounter sea lions, seals, and seabirds. We had a few sea lions swimming alongside our kayaks, and we saw a number of seabirds, including cormorants, which we learned can dive deep into the ocean and stay underwater for a long time. In addition to the sea life and sea caves to be seen, La Jolla kayak tours provide gorgeous views of the San Diego coastline from an angle not seen by most visitors to San Diego. Everyday California will give Travel the World readers 50% off of any full price tour. Call them directly at (858) 454-6195 to book your tour and give them the coupon code Travel50. So I will admit Segways just look dorky. When I first saw a Segway tour I thought “I will never take one of those tours.” However, at the San Diego Travel & Adventure Show San Diego Segway Tours set up a practice course which I begrudgingly tried out. In that short session I was converted. It didn’t matter how dorky I looked rolling around on two wheels with a helmet on my head, riding a Segway was fun. San Diego Segway Tours offers two tours, one through Balboa Park, and the other through downtown San Diego, the Historic Gaslamp Quarter, and Embarcadero Waterfront. We chose the newer Balboa Park tour. While both our GoCar and Segway tours traveled through Balboa Park, they passed different areas as the Segways stick to the sidewalks and can visit the pedestrian only areas. After a short training session, the Segways are very easy to drive and control. The real concern is getting too comfortable, as within a short time you become one with your Segway and start paying more attention to the scenery then where you’re going. As long as you watch out for curbs and bumps, you’ll be zipping along just fine, covering a lot of ground, and having a great time. During our Segway tour we encountered some gems of Balboa Park we had never seen before. There is a statue of Kate Sessions, who is credited for many of the trees and plants in the park, causing her to be referred to as the “Mother of Balboa Park.” There is also a grouping of statues of some of the city’s founders including Ephraim Morse, Alonzo Horton, and George White Marston. In addition to passing by the many museums of Balboa Park, we also visited the Organ Pavilion, fountain, rose garden, and cactus garden, which has a cactus that was 150 years old when it was transplanted 80 years ago. Again, visiting Balboa Park on a guided Segway tour allowed us to see things we had never seen before, even though we’ve lived in San Diego our entire lives and have visited the park numerous times. San Diego Segway Tours will give Travel the World readers 40% off their total purchase by entering the online coupon code TRAVELEXPO at checkout. If you’re looking for some unique things to do in San Diego, don your helmet, board your vehicle, and try out one or more of these fun outdoor activities to get a different view of America’s Finest City. Thank you to GoCar Tours of San Diego, Everyday California, and San Diego Segway Tours for hosting our unique San Diego outdoor activities and making this post possible. Also, thank you to my aunt Kathy, a repeat San Diego visitor looking for new things to do, for the inspiration. As always, all opinions are my own.